One of the better improvements for Albert Heijn, a local grocery store, is the option for self-scan. And not the version I’ve seen in the United States where you need to weigh each item as you scan it to make sure there’s no thievery going on. Here it is simply scan each item and then pay at the end. Though I do understand the need for the US system. Self-scan at Albert Heijn is wonderful. It’s no longer horrible to go right after work, when its crowded and the lines are 5 to 7 customers long. Seriously – before self-scan I would always swear a bit if Marco asked me to pick up something after work, it was that bad. Those days are long gone, as I can count on one hand the times I’ve had to wait for an available self-scan register, and even that was never longer than 30 seconds. The only problem with self-scan: You are required to print out a receipt, since you need to scan the receipt to allow the exit gates to open. I almost always said no to a receipt previously, when going through a “manned” line with a checkout worker. Why waste paper? That is also now a thing of the past! Longer, full receipt (for ONE item!) on the left, versus the short receipt on the right. This week after paying I was greeted with the question “Would you like a full receipt, or only a short receipt to open the gates?” Very nice. You can see the difference above, with the bar code removed. 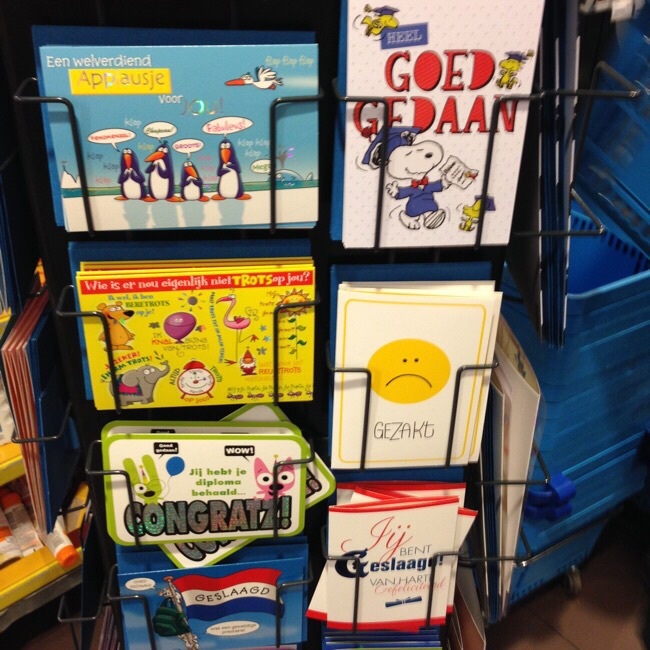 A great improvement, Albert Heijn! Oh, and for the people who read small font really well, yes, the receipt says “1 insecten”. I did not win or buy an insect, rather, Albert Heijn has a promotion where you can receive insect stickers and fake insect tattoos for every 10 euros spent. The receipt lets the worker know that I can receive 1 set because I’ve spent more than 10 euros. The American-style cereals are definitely starting to take over… I mean, Frosties have been here for a few years (at least) but Unicorn Froot Loops is a new one to me! On the other hand: all hail the influx of Pop-Tarts (EN Wikipedia | NL Wikipedia) to this country. Lots and lots of wine bottles… someone must have had a party! This is by the bottle return area (the bottom part pictured here is for returning a beer crate), so I assume wine bottles don’t have a deposit on them. I am not much of a wine drinker (besides the occasional prosecco) so I’m not sure. Still, kudos to them for leaving them behind without making a mess. Although it does mean work for Albert Heijn to get rid of them. Their Easter selection is pretty good when it comes to chocolate, I must admit. Lots of Cadbury eggs. Did you know it costs 10 euros for a 12 pack of pop/soda? And that’s a discounted price! Back home you could get it for 2/$5 during the right sale. Of course, that’s just how it goes when you’re an expat so far from home. Anyone need any chocolate eggs? There are lots of flavors to choose from… But still, it doesn’t compare to the Reester bunny. Don’t you just want to nibble on those ears? It is smoked meats (meat covered in spices like paprika, black pepper, and similar). But this time we have luxury pans. Cool. Actually, Marco and I don’t really need anything, so we’ve been saving up for Roger to use them if he wants. Since this photo was taken we’ve collected more stamps – at this point we have exactly enough. Definitely “luxury” pans – one pan requires 60 stamps. In theory you receive one stamp for every 10 euros you spend, though there are ways to get additional stamps if you buy certain items and sometimes you get more stamps than you should. We’ll probably keep collecting stamps on the off chance someone else needs them, but I don’t think we’ll attempt to fill another card. However, we have until mid-February so you never know. The weather is absolutely, positively cruddy today. It’s been raining all day — even pouring during the evening commute. Yuck! On another note, it is my 4 year anniversary by WordPress today. Hard to believe. Albert Heijn (a grocery store) has been running a promotion the last few months. Save up 50 stamps and you can exchange them (for a bit of money as well) for luxury silverware. You can get one stamp for every €10 you spend. Don’t get me wrong – it’s an expensive way to get the silverware. But if you don’t change your buying habits just to get more stamps it works out. Marco and I have about two cards full (with help from Roger and others). Marco is specifically saving up for a few of the knives. Some of the knives are so sharp they even come with instructions on how to get them out of the packaging safely. If you are also saving stamps — happy (future) slicing! I did not post the picture to show how tall the shelves are/how short I am. I already know that! Usually Marco is around when I need something from a tall shelf so it works out, thankfully. 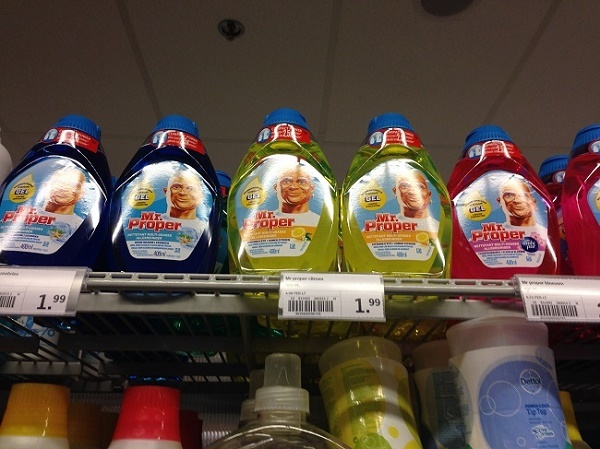 The photo is actually of a cleaner called “Mr. Proper”. If you’re American you’ll probably more easily recognize it as “Mr. Clean”. But like most things, names are translated into local languages. And that doesn’t stop at everyday purchases – for example Hermione in the Harry Potter books is named Hermelien in Dutch. Hmm. I read the Wikipedia article for “Mr. Clean” before writing this blog post. My favorite random fact was the following: “make mrproper is a command in the Linux kernel build system, used to “clean up” all files from past builds and restore the build directory to its original clean state.” And of course proper was used in place from clean because the creator of Linux was from Europe. And thus ends our random Dutch supermarket lesson. 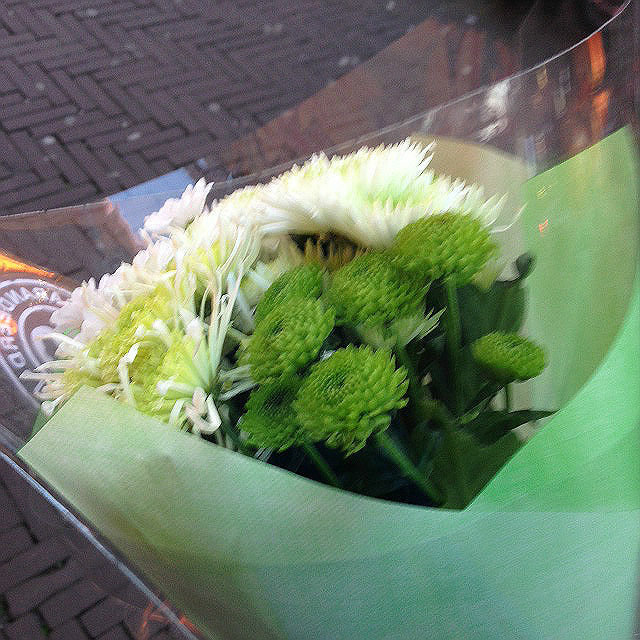 I made a quick trip to Albert Heijn to pick up some broccoli. (If you had told me five years ago that I would willingly buy broccoli, I would have laughed. Hard.) Anyway, it was rather busy when I went so I had plenty of time to stare at the items for sale around the cash register, especially the “Congrats! You survived the hell that is school!” cards. And then I noticed one of them isn’t quite the same as the others. You don’t even need to know Dutch to guess which. For your information, geslaagd means that you passed. Gezakt, with the sad looking smiley above on the right? Bummer. You failed. I took a peek inside – blank. Last week my mother-in-law and I made a stop at Albert Heijn. She had a coupon from the Allerhande (the Albert Heijn recipe book) for a discount on Senseo coffee. The coupon itself was good from mid-March until today but she hadn’t had much luck finding an Albert Heijn with the item in stock. When she asked at the customer service desk for this particular Albert Heijn (Grote Markt 55A) whether they had the item in stock, the worker looked in the back for the item and whether or not it might be re-stocked soon. When she couldn’t find it, she offered a few different options. My mother-in-law was quite pleased with this service and remarked about how the service at this Albert Heijn was better than at her own. At this remark we both received flower bouquets, a quite unexpected move.